Balsa core material is a cost-effective material, which can be tailored to specific applications. Balsa honeycomb-like cell structures are configured into end grain panels as per specific requirements. Balsa trees grow rapidly, and their core materials are increasingly being used in production of boats, in transportation, wind turbines blades, and structural composite panels. High specific stiffness & rigidity and enhanced moisture resistance make balsa core material suitable for wide range of applications. The sandwich panel of balsa wood cores is used in aircraft construction to reduce weight and achieve high compressive & tensile strength. In the UK and abroad, aerospace designers and aircraft manufacturers are shifting their preference towards balsa wood core material for hovercraft, aircraft, and helicopter manufacture. 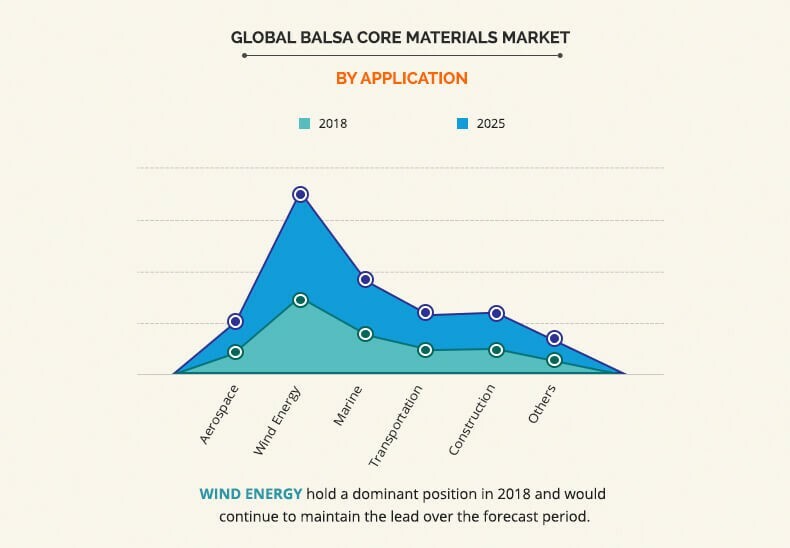 The major driving factor that is responsible for the growth of balsa core material market is upsurge in demand for lightweight materials across several end-use industries. Furthermore, growth of aerospace industry across various regions has fueled the market growth. However, high material cost is expected to hinder the market growth. 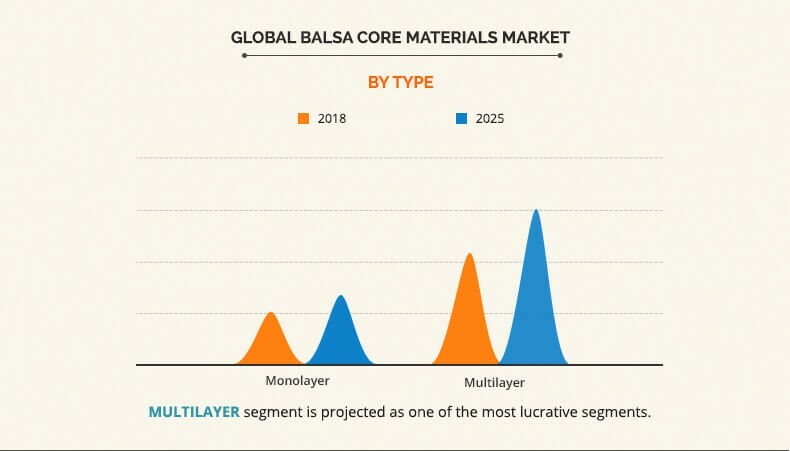 On the contrary, mergers and acquisitions of balsa core material manufactures and technological advancements are expected to provide lucrative opportunities for the market growth. The global balsa core materials market is segmented based on type, application, and region. On the basis type, it is bifurcated into monolayer and multilayer. The applications covered in the study include wind energy, aerospace, marine, transportation, construction, and others. Region wise, the market is analyzed across North America, Europe, Asia-Pacific, and LAMEA. The key players operating in the market include DIAB, Schweiter Technologies, BCOMP LTD., Carbon-Core Corp, Gurit Holding AG, Evonik Industries AG, I-Core Composites, LLC, CoreLite Inc., BONDi (Shandong) Environmental Material Company Limited, and Nord Compensati Spa. The Asia-Pacific balsa core material market is expected to witness rapid growth rate during the forecast period, owing to development of the marine & wind power industries. 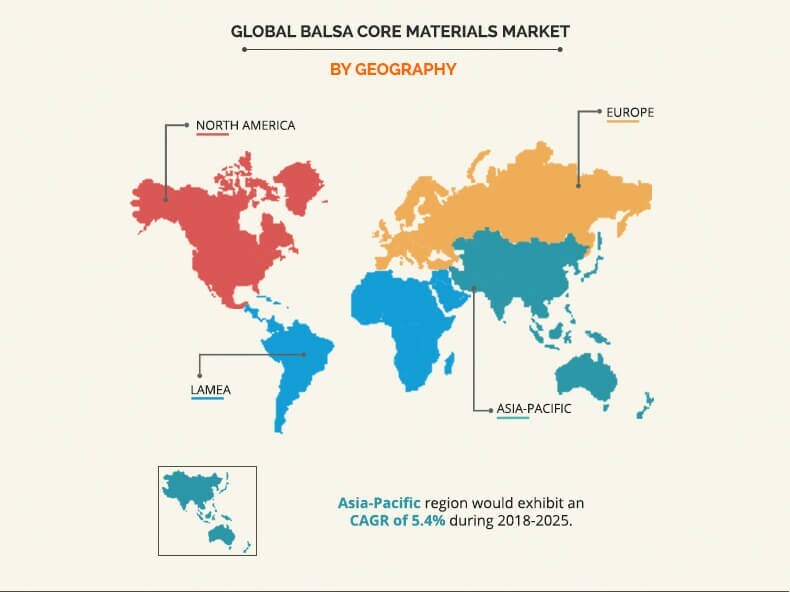 In addition, increase in demand for lightweight composite materials in economies such as India, China, Korea, Australia, and Japan boosts the growth of the balsa core material market in the region. The multilayer segment is projected to be the most lucrative segment, owing to its higher energy absorption property as compared to monolayer materials. This has led to increase in adoption of balsa wood with multilayer coating in a wide range of applications such as aerospace, marine, and construction. The wind energy segment garnered the dominant position in 2018, and is expected to continue to maintain the lead during the forecast period, due to increase in demand for cost-effective & environment-friendly generation systems and implementation of stringent government regulations to reduce emission of greenhouse gases. In addition, increase in investment by financial institutions such as International Finance Corporation, Green Investment Bank, and the World Bank for the development of wind energy market is anticipated escalate the market growth in the near future. This report provides an extensive analysis of the current trends and emerging estimations in the global balsa core materials market. A comprehensive analysis of factors that drive and restrain the market growth is provided. An extensive analysis of the industry is conducted by following key product positioning and monitoring the top competitors within the market framework. Balsa core material is a type of honeycomb structure material that is available in a wide range of thickness, density, and form. Asia-Pacific is anticipated to account for a significant share in the global balsa core materials market, owing to large number of installations of wind turbine capacities. Some of the key players in this region have focused on collaborations to cater to the need of continuous supply of balsa core materials. Balsa core material is widely used in the aerospace industry, owing to its lightweight. Moreover, it has structure similar to that of the honeycomb core, and is available in the market in a wide range of thickness, density, and format/finish. Furthermore, it exhibits high compressive property, enhanced thermal insulation, and remarkable acoustic retention, which fuel its adoption, thereby boosting the growth of the market. There is a growing requirement to increase reliability of wind turbines and ensure that turbines remain workable for 20 years or more. Balsa core material is an advanced composite material, which offers high strength, stiffness, and fatigue resistance to components, and is low priced. The growth of the global wind energy market is projected to be driven by increase in demand for cost-effective & environment-friendly generation systems and implementation of stringent government regulations to reduce emission of greenhouse gases.